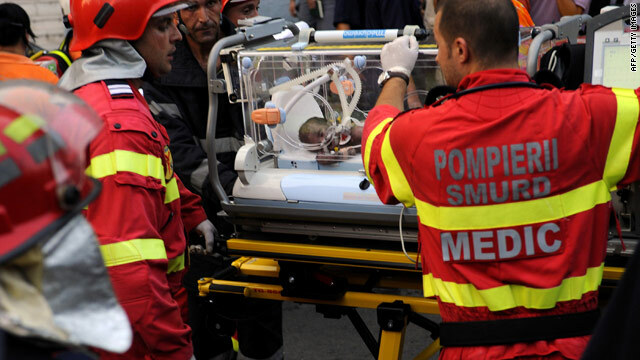 Medics evacuate a newborn baby injured by a fire at the Giulesti maternity ward in Bucharest on Monday. Bucharest, Romania (CNN) -- The managers at the Romanian hospital where four newborn babies died in a fire this week have been suspended until the investigation into the fire is completed, the Bucharest mayor said on Wednesday. Mayor Sorin Oprescu, who said an interim hospital manager has been appointed, said he has the power to name or dismiss hospital managers, but wanted to wait for the final results of the probe. Seven other newborn babies remain critically injured with severe burns over 40 to 75 percent of their bodies and burns in their airways, said Dr. Dan Enescu, director of the Grigore Alexandrescu Children's Hospital in Bucharest. Health Minister Cseke Attilla told a news conference that he had asked the mayor to dismiss the entire management team at Giulesti Maternity Hospital, where the fire happened Monday. Attilla said he thought of stepping down himself but reconsidered because the hospital is run by the city, not the Health Care Ministry. There are now at least 25 doctors taking constant care of the injured newborns, Enescu said. Ten Israeli specialists arrived in Romania on Wednesday to offer their help in treating the babies, he said. The hospital's priest has baptized all of the surviving newborns, Enescu said. Pictures of the burned intensive care unit, published Tuesday in the Romanian newspaper Adevarul, showed a burned incubator, a blackened room and singed and melted equipment. Prosecutors said the fire burned slowly for about an hour before any medical staff entered the room. The intensive care room had been unstaffed at the time, they said. Police and prosecutors were continuing Wednesday to talk to those involved in the case, including medical staff, parents, patients, witnesses and the specialists who installed and periodically controlled the air-conditioning system. A nurse was supposed to be in the intensive care unit at all times, prosecutors said. The one who had been on duty told investigators she left the room because she needed to go to the toilet, but it was not clear how long she left the ICU unstaffed, prosecutors said. Marius Iacob, the chief prosecutor in the investigation, said they will analyze surveillance camera footage from the hallways at the ICU to see when the nurse left the room. However, Dorin Olteanu, chief of the firefighting teams, said no adult could have safely escaped the fire in the ICU, meaning no one was inside the room with the babies for a long time after the fire broke out. The fire forced the evacuation of everyone in the hospital, including five women in labor, another 26 pregnant women, and six who had just given birth, Raed Arafat, state secretary deputy in the Health Care Ministry, said Monday. Dozens of people have since gone to the Giulesti hospital, which is now closed, to bring flowers and plush toys in memory of the lost babies. The government decided Wednesday to give 5,000 Romanian leu ($1,532) to each family who lost a baby, and 3,000 leu ($707) to those whose babies were injured, Attilla said. He said the government also decided to create mixed teams of specialists to inspect all hospitals in Romania and check their readiness to act in case of a fire.